Can be used for the detection of GAPDH. GAPDH Antibody is affinity chromatography purified via peptide column. Our Abpromise guarantee covers the use of ab37168 in the following tested applications. WB Use a concentration of 0.5 - 1 µg/ml. Detects a band of approximately 36 kDa (predicted molecular weight: 36 kDa). Only tested on peptide ELISA. ICC/IF image of ab37168 stained HeLa cells. The cells were 100% methanol fixed (5 min) and then incubated in 1%BSA / 10% normal goat serum / 0.3M glycine in 0.1% PBS-Tween for 1h to permeabilise the cells and block non-specific protein-protein interactions. 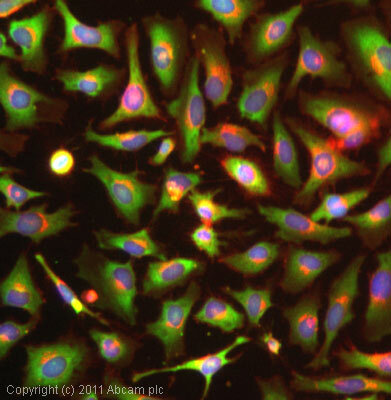 The cells were then incubated with the antibody (ab37168, 1mg/ml) overnight at +4øC. The secondary antibody (green) was anti-rabbit Alexa Fluor® 488 (ab150077) used at a 1/1000 dilution for 1h. Alexa Fluor® 594 WGA was used to label plasma membranes (red) at a 1/200 dilution for 1h. 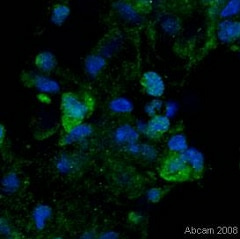 DAPI was used to stain the cell nuclei (blue) at a concentration of 1.43æM. Immunohistochemistry (Frozen sections) - Anti-GAPDH antibody - Loading Control (ab37168)This image is courtesy of an Abreview submitted by Pete Geisen. 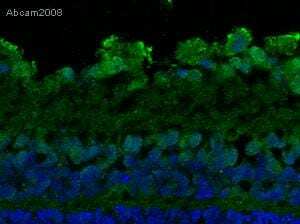 Immunohistochemical analysis of Rat retinal tissue, labelling GAPDH with ab37168 (diluted 1/50). Tissues were fixed in paraformaldehyde. Sample was incubated in primary antibody for 2 hours at 25°C. Immunohistochemical analysis of Mouse lung tissue, labelling GAPDH with ab37168 (diluted 1/100). Tissues were fixed in paraformaldehyde. Sample was incubated in primary antibody for 2 hours at 25°C. ICC/IF image of ab37168 stained Hela cells. The cells were 100% methanol fixed (5 min) and then incubated in 1%BSA / 10% normal goat serum / 0.3M glycine in 0.1% PBS-Tween for 1h to permeabilise the cells and block non-specific protein-protein interactions. The cells were then incubated with the antibody (ab37168, 1µg/ml) overnight at +4°C. The secondary antibody (green) was anti-Rabbit DyLight® 488 pre-adsorbed (ab96899) used at a 1/250 dilution for 1h. Alexa Fluor® 594 WGA was used to label plasma membranes (red) at a 1/200 dilution for 1h. DAPI was used to stain the cell nuclei (blue) at a concentration of 1.43µM. 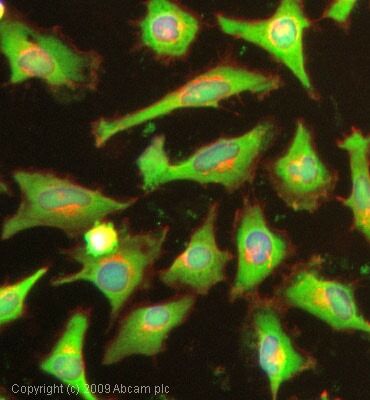 Immunofluorescence of GAPDH in HeLa cells using ab37168 at 10 ug/ml. Publishing research using ab37168? Please let us know so that we can cite the reference in this datasheet.